Born in Pittsburgh in 1934, Stanley Turrentine took up saxophone at the age of eleven, encouraged by his father, who had played the same instrument with Al Cooper's Savoy Sultans. 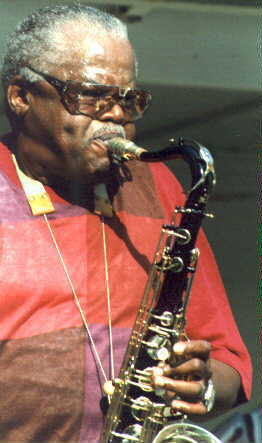 Turrentine's first professional gig was with Lowell Fulsom's blues band. "I guess my sound started back then," he says, "I couldn't avoid the blues. That band had a blind piano player in it, name of Ray Charles." Charles was already writing songs, which Turrentine would transcribe after they finished work in the joints and barns the band played. After leaving Fulsom, Turrentine moved to Cleveland, where he gigged with Tadd Dmeron before going on the road again in Earl Bostic's R&B combo. Following two years in the army (1956-1958), he joined Max Roach. It was at this point that Turrentine began to make an impression in the jazz world. In particular, he caught the attention of Alfred Lion, who signed him to an exclusive contract with Blue Note Records that lasted until 1969. During this ten-year period, Turrentine recorded regularly as a sideman for the label on albums by Horace Parlan, Art Taylor, Jimmy Smith, Duke Jordan, Horace Silver, Duke Pearson, and Kenny Burrell. For several years in the 1960s, he co-led a combo with his wife, organist Shirley Scott. "We called it the 'Chitlins Circuit.' A lot of small places, with bad sound systems, small audiences . . . We used to deadhead a lot. Twice we drove to the coast in three days, New York to L.A., eating in the car, sleeping in the car, with the organ in a little trailer in the back. You'd get there to the gig and for days you'd still feel like you're still riding. It's funny now; it wasn't so funny then. We'd get to clubs where the hallways were too narrow for the organ, and once in Virginia, we had to carry the organ up three flights of fire escapes. But for all that, we'd go in that night and we'd blow our hearts out." What first leaps out and grabs the listener's attention is Turrentine's sweet yet muscular sound, which suggests Johnny Hodges more than the classic Swing tenors. A flexible voice, it can deepen to a resonant honk, soar into one of the most piercingly full-throated cries in jazz, and broaden to a thick, sensuous vibrato on ballads. Turrentine tends to play on top of the beat, making for a deep, trancelike groove, and his phrasing draws on both modern jazz and R&B. Angular lines alternate with timeless blues phraseology. Turrentine's work has been remarkably consistent. Turrentine passed away September 12, 2000.